Based on SpliceCom's virtual/soft voice platform and touch screen phone technology, OCP was originally developed in conjunction with iCS and prime contractor British Aerospace Systems (BAe) to meet the exacting requirements of the Royal Navy's next generation Sub-Surface Training System, integrating control of weapons systems, radar and navigation on a bespoke communications platform. Since OCP's introduction in 2014, systems have now been rolled out to the six Royal Navy submarine training centres across the UK. 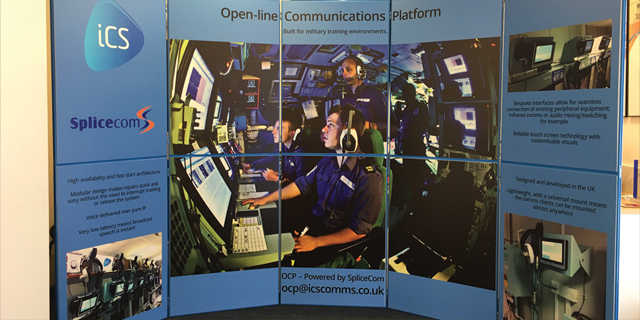 Camberley based iCS are now launching their flexible command & control system to a wider audience within the military community, with attendance at ITEC forming a core element of their marketing strategy. ITEC is the international forum for the military simulation, training and education community. Established for over 26 years, ITEC presents a unique overview of the industry's latest innovations. The event provides visitors with a platform to discuss developments in this evolving market and exchange ideas about future requirements for military training and simulation. "By using SpliceCom technology to meet the MoD's Sub-Surface Training System requirement, we now have a solution that is easy to deploy, simple to use, quick to diagnose and maintain, without the need to completely close the Trainers as was the case with the older systems. Fast start times and easy "on the fly" configuration makes OCP a pleasure to work with," said Steve Johns, MTS Area Manager for British Aerospace Systems. "SpliceCom's flexibility as a company and our close relationship with them as a business partner, were key to making OCP happen," said John Gillborn, Director & Founder at iCS Communications. We've always found that where there's a system requirement that's a little out of the ordinary, and there's a real business need with a realistic budget in place, you're far more likely to achieve it with a SpliceCom system than anything else," concluded Gillborn.